I was always a Butter-Naan person when it came to ordering Indian breads in restaurants.Yes,the dripping with butter and soft and fluffy naans to mop up the yummilicious Paneer Butter Masala would take me to food nirvana.No amount of teasing from Ajay about fat and calories would stop me from having it,in my defense I'd say we don't eat it daily! 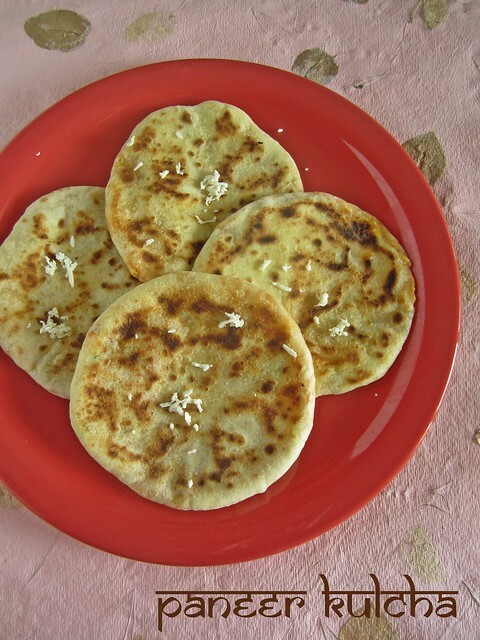 I think it was during one of those rare days when I felt like ordering something new I tasted a Kulcha.When it reached our table it was hot and puffy and was all I hoped for and more.Soft and fluffy and slathered with butter and filled with a mixture of paneer and onions,what's not there to like? I'd been wanting to try it at home since a long time.It doesn't require Yeast and is leavened using baking powder or baking soda.You can of course make it plain or stuff it with paneer or onions or spiced potato masala.It tastes great with any north indian curry,particularly Chole.I'd made Malai Kofta and should say it is indeed a delicious combination. 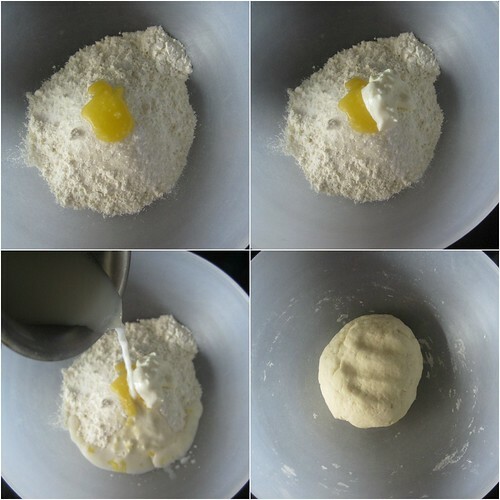 Mix together all the dry ingredients and mix in enough milk and knead into a smooth dough. Cover the dough with a damp towel and keep aside for an hour. 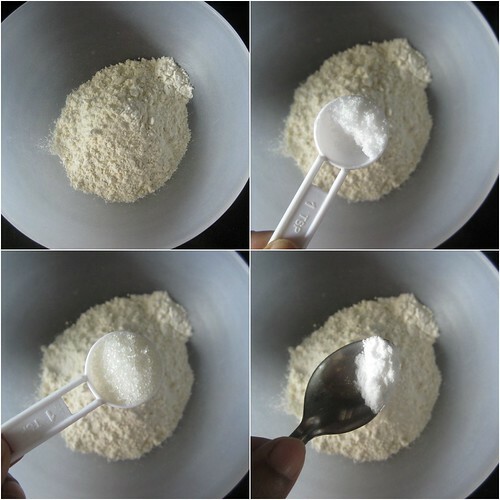 Mix together all the ingredients.Divide into 5 portions and shape into a smooth ball. 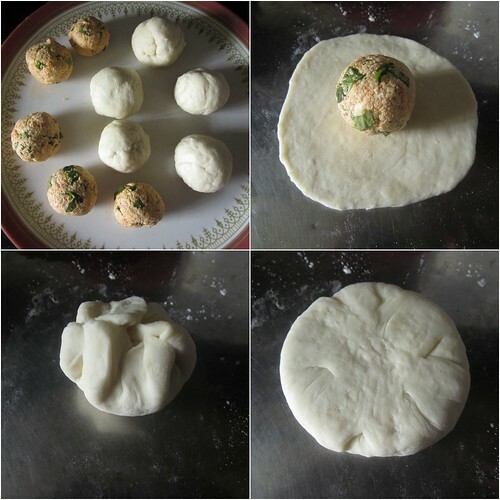 Divide 5 portions of the dough and shape into smooth balls.Starting with one roll into a thick poori sized shape. 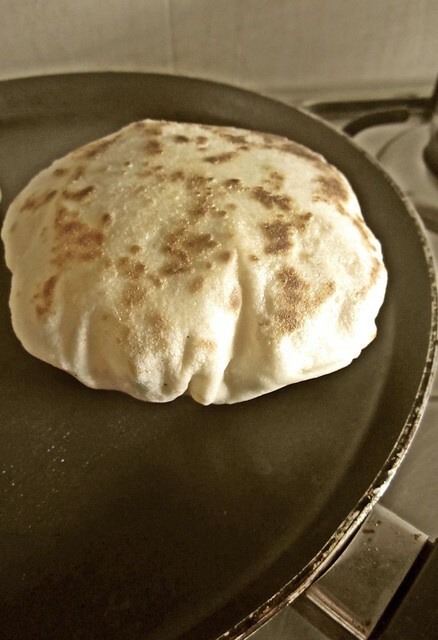 Keep the paneer filling in the middle and close the sides carefully making sure the filling is covered from all sides.Shape into round discs and rest it for 10-15 minutes.Repeat the procedure with the rest of the filling. Flatten the balls into thin kulchas using enough flour to dust,without giving much pressure so that the filling inside stays intact. Heat a chapathi tawa and cook the kulchas till golden brown on both sides adding enough ghee/oil/butter to taste.The kulchas will puff up beautifully creating pockets inside which would make it fluffy. 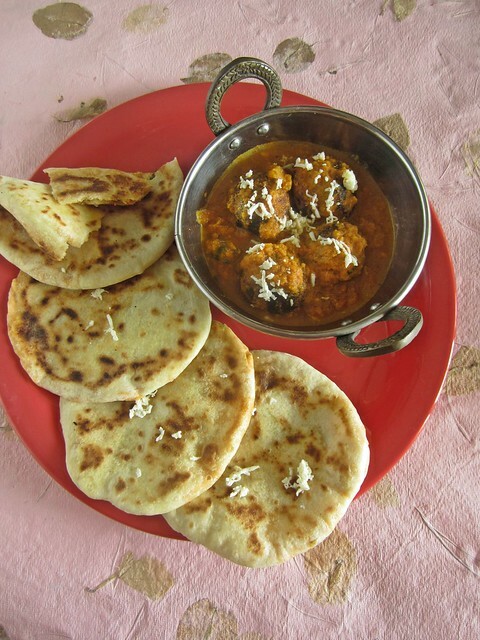 seriously yummy :) i am not a butter naan person :) where us i always order stuffed parantha ! The kulcha looks very yummy. They have puffed up so well on the Tawa. I feel like digging into them straightaway. BTW Divya did you studay in agnes Mangalore? Thanks.No,I did my studies in Cochin,Kerala. Yummy.. It's easy & also healthy when prepared at home..
Yummm drooling here. I had been following ur blog for quite sometym.itz really awesome. I would like to request a recepie from you Can u post the recepie for strawberry short cake plx. I'll keep your request in mind Shalini.Unfortunately Strawberries are not in season for the time being! wow!! loved the way it have fluffed up !! gorgeous kulchas.